I woke up at 4:30 this morning. My alarm was set for 5:15 but I often wake up early if I have to get up for something. Last August, I photographed these towers with a Canon PowerShot S5IS, because I only had the 18-55mm kit lens. Since then, I’ve acquired a 55-250mm lens, so I set up my tripod and took the same photo again. 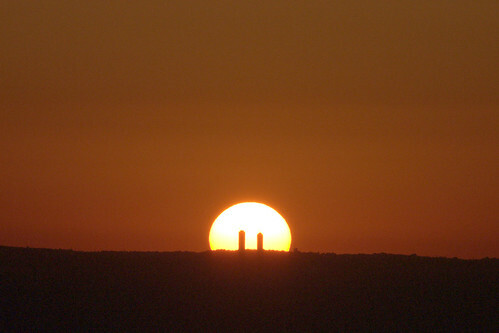 And this time the sun actually lined up with the towers! These photos were taken on Rehov haGilgal, Mitzpeh Nevo, Maale Adumim, Israel. The distance between Mitzpeh Nevo and Amman is about 70 kilometers. In the cropped photo below (taken just before sunrise) you can see that they replaced the crane on the south tower, which collapsed almost a year ago (May 16, 2009), at a height of 200 meters. The buildings are still under construction. I have no idea how many stories they are now. This entry was posted on May 5, 2010 at 6:54 am	and is filed under photography. 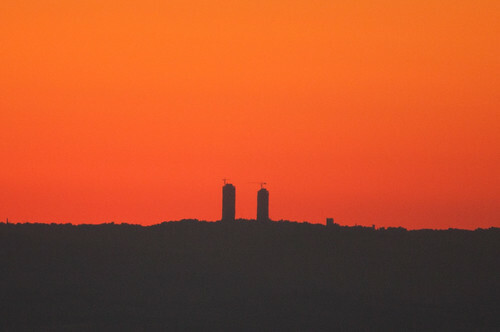 Tagged: Amman, photography, sunrise. You can follow any responses to this entry through the RSS 2.0 feed. You can leave a response, or trackback from your own site. Beautiful shot, Avital & motivating. Just bought a Tamrom 18-270 last week for my xti. Fingers crossed. Who would have believed you can see such detail in Amman from Mitzpeh Nevo! I wouldn’t normally respond to the various beautiful pictures you’ve posted (since I’m only of the male persuasion), but this really surprised me. Kol HaKavod. Thanks for visiting my blog, Simcha! I won’t hold your persuasion against you. Nothing quite like a good sunrise, is there? This is interesting to see such a lovely silhouette of a landscape I have never seen. In my neck of the woods, the sun comes up behind the Rocky Mountains and turns the snow atop those mountains to a glowing pink. Isn’t this a nice reward not only for getting out of bed at such an early hour but also for waiting a whole year to try again? It will be fun to see how tall the towers have grown this time next year! I remember when I saw these towers with a barely aided eye (simple eyeglasses to help me see things more than 10 feet way) on my way to the 6 am morning prayer. It knocked me out then, and barely a morning goes by (or evening, for that matter) when I do not look for them. One of the most fascinating things about Mitzpe Nevo Maale Adumim imho. And great pictures, too, of course, btw.